Information and Communication Technologies (ICT) can be used in diverse applications to accelerate information dissemination to improve efficiency of public services, to increase the transparency and accountability of government administration, to reduce corruption, and to facilitate citizen participation in local governance. Given the fact that few ICT projects in rural areas have scaled up, it seems that the full potential of ICT as an enabler of development is yet to be tapped. This chapter analyzes two projects from India that have overcome these challenges and have scaled up. In moving forward on digital inclusion so far, the focus has been on creating equitable access to Internet and other technologies. Adequate effort has not gone into understanding the context in which these technologies can deliver value by alleviating key problems of development in rural areas. A paradigm shift is needed. Instead of developing a technology and then looking for a context where it can be used, it would be more effective to understand the problems of the poor and identify what technology innovations can help solve any part of the problem. Invariably, technology will not be enough; other components will need to be put together to create a development. Mobile-based delivery, which can overcome some of these constraints, needs to be explored in a major way. In addition, new content useful for rural populations needs to be made available in the public domain. 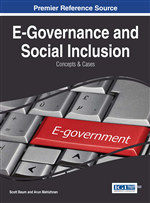 This is an example of an eGovernance application that covers two social services for the poorest of the poor in India. One of the services is the National Old Age Pension (NOAP) Scheme. Under the NOAP, central assistance of Rs. 500/- per month is granted to destitute elderly persons above 65 years. The scheme also covers the physically handicapped, widows, weavers etc. The second service is the National Rural Employment Guarantee Scheme (NREGS) that guarantees wage employment on public works to any adult who is willing to do unskilled manual work, subject to a guaranteed employment for 100 days per household per financial year. The objective of the scheme is to enhance the livelihood security of the people in rural areas by generating wage employment through works that develop the infrastructure base of that area. More than Rupees150 billion has been paid as wages under NREGS since its launch in February 2008.